Fossils from the last Ice Age were discovered at a construction site in California. The bones of ancient mammoths and bison dated at up to 200,000 years old have been discovered in a new housing development in California. The fossils, which are believed to be from the last Ice Age, were found at a construction site in Carlsbad as workers were gearing up to build hundreds of new homes, according to a San Diego Union-Tribune report. The fossils are at least 50,000 years old and up to 200,000 years old. The bones weren’t just from the massive prehistoric beasts, but also the smaller ones, with bones from horses and turtles also found along with the mammoths and bison. It’s only the second time that prehistoric bison have been found in San Diego County. Scientists believe the fossils could tell them a lot about the climate and the environment of the time, as well as the ecology of the area around them. It could provide insight into an ancient ecosystem, and also show how climate changed over the years. The discovery happened this summer when workers were grading at the Quarry Creek development site, a 60-acre plot that was to be home to a new-home community. A paleontologist was already on site thanks to a California law that requires that to be the case when large amounts of earth get moved for a construction project. Once the bones were discovered, the work was halted so the bones could be excavated. The specimens have since been moved to a museum. They have been placed in a plaster jacket to protect them, and that jacket will be carefully removed so it can be put on a temporary display as authorities figure out where its permanent home should be. A bison fossil was found three years ago at another construction site in the county. The fossils that were discovered in this community in Carlsbad included two Columbian mammoths. 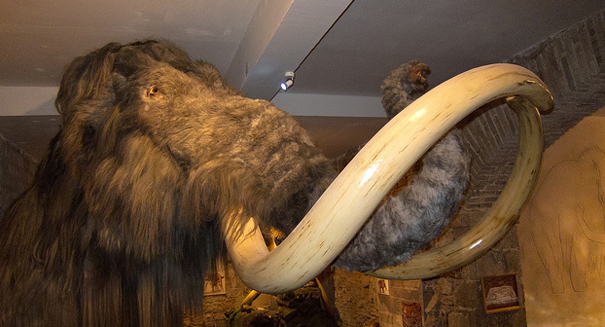 These mammoths were larger than the more famous woolly mammoths.